Several weeks ago, I was sent a few items from Boxwave to review. I did a quick review of the three products and promised to do a more extensive review and then provide a means to win each of the goodies. Today we start in with my most used and most liked of the three, the Quorky pouch iPad case. I pretty much take my iPad 2 everywhere and this case makes it easy to transport pretty safely in style. It fits an iPad 1 but it feels a little tighter, it should accept the New iPad (iPad 3) with no problems. 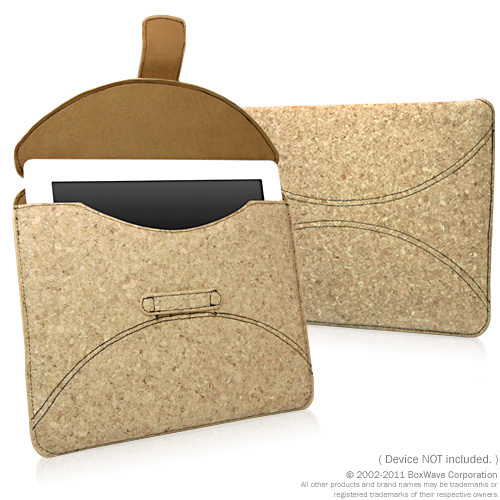 From the product page on Boxwave: "Cork is harvested using bark tissue from trees indigenous to the Mediterranean region. Farmers harvest the single layer of exterior bark, leaving the tree trunk and interior bark intact and able to regrow all that was taken. A single Cork Oak tree can be harvested from every 8-14 years of its 200-year life." So you can feel pretty good about using cork as it's environmentally friendly (though a part of me often wonders how the tree feels about having it's outer "skin" sliced off every few years?). The Quorky feels good in use. The cork has a slight bit of give to it and isn't slippery at all. The interior of the case is finished in soft cloth to help protect the screen. It also looks cool, I know this because people tell me this everyday. Several people have asked where I got it and I am happy to point them to Boxwave. I also often joke that the case doubles as a really big drink coaster (a "feature" I've not tried out). The case is functional, good looking and seems pretty durable. The one change I'd make in the design would be to redesign the closure mechanism as it requires quite a bit of effort to bend the tab to slide it through the flat loop. Lowering down or making the tab out of some other material would resolve the issue but it isn't, by any stretch, a major problem. I simply slid my iPad into it and rarely bothered to "secure" it with the tab. My sole other issue with Quorky applies to pretty much all cases of this style. They are great for protecting your iPad in transit but they do nothing to keep it protected when you are actually using the iPad. My iPhone is nearly always protected within its Speck case (which is very hard to get off, if you need help then check out my post on how to do it without going all Hulk Smash rage-y). I like my gear to be protected at all times and the Quorky, by its nature, precludes this. Overall, I'd give the Quorky 3 stars out of 4. If this kind of case is what you're into then you could definitely do worse than the Quorky. And now to the fun part, how to win it. I've been toying with mechanisms but I think the simplest method is probably the best. Leave a comment on this post to be entered into the drawing to this Quorky, be sure to include an email address or I can't connect up with you. If you want to help spread the word then I'd be much obliged even though I know spreading the word would make it harder for you to win it. Next up, the Trignetic Capacitive Stylus and the TriConnect Mini DisplayPort Adapter reviews and giveaways. Note, these are non-compensated product reviews. Boxwave provided the products free of charge with the stipulation that I review them and then give them away by whatever means I chose.